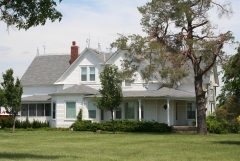 Enoch and Helen Eliason purchased this Dickinson County farmstead in the 1890s and built the Midwest Prairie-style barn in 1915. It was rebuilt in 1917 after being struck by lighting. 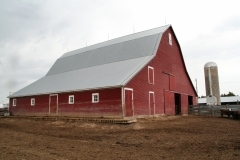 The barn is rectangular in form with a tall gambrel roof and original shed bays on each side that create a wide, sweeping roof form characteristic of the style. The gabled hay hood features doors that slide down the exterior along the slope of the roof. They operate on a pulley system with two original concrete weights on the barn's interior that are stamped "1915". The interior reflects its original multiple uses of storing hay and housing livestock. The barn is nominated for its agricultural and architectural history. 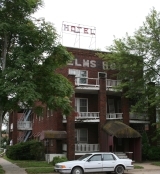 The Elms Hotel (ca. 1919) is a three-story brick building located in the original part of Abilene's downtown area that was once part of the 1870s cattle trade district. Known originally as the Forster Hotel #2, it is nominated for its association with early 20th century hotel developer Jacob Forster who owned three hotels within two blocks of the rail lines. The Elms Hotel is also nominated for its association with community growth and development and its reflection of the Commercial style architecture. Key defining features include the two three-story porches with white balustrades located on the north and east elevations. 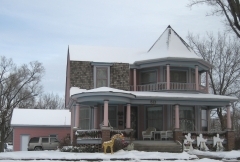 Replacing an earlier house that was destroyed in a 1910 fire, the Jacob S. Engle House was completed in 1911 by prolific Abilene contractor, Jacob L. Kruger. 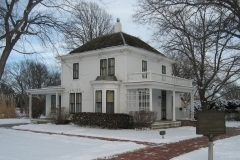 The Engle family–which at its largest included parents Jacob and Annie and their seven children, as well as a butler and maid–lived in this house from 1911 until Jacob’s death in 1923. The house is an excellent local example of a transitional architectural style that mixes restrained Free Classic Queen Anne and Craftsman elements. 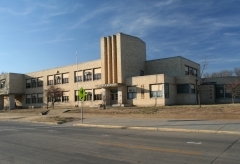 Designed by Kansas City-based architect Joseph W. Radotinsky, Abilene's Garfield Elementary School was built in 1942 with the assistance of the federal Work Projects Administration. Radotinsky's designs of the 1930s and 1940s were notable, breaking from the Progressive Era tenets that had defined educational architecture for the first three decades of the 20th century. A review of school board minutes and local media coverage of the school's planning and construction clearly portrays an emphasis on modern accoutrements, an attention to functional aspects of the school's use, consideration of maintenance and performance of materials, and planning for future expansion. With its blond brick and concrete construction, horizontal lines and bands of windows, stepped bays, and simple form, it is an excellent example of Modern and Art Moderne architecture. 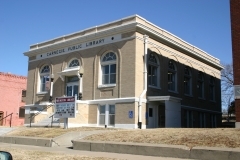 It was nominated as part of the "Historic Public Schools of Kansas" and the "New Deal-Era Resources of Kansas" multiple property nominations for its association with local educational history and its architecture. Civil War veteran David R. Gorden arrived in Kansas in 1866 and found work with the Union Pacific Railroad as a telegraph operator. In 1869, he transferred to Abilene where he served as UP’s first station agent during the height of cattle-shipping activity. Gorden had many local business interests and also served as Abilene’s postmaster from 1889-1894. He hired architect Franklin Keagy of Chambersburg, Pennsylvania to design this residence, which was completed in 1877. 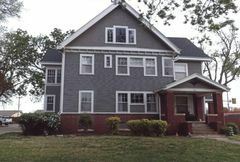 The two-and-a-half-story house reflects the late Victorian-era Gothic Revival style, with its brick exterior, decorative gable trim, paired peak-head windows in the front gable, and round-arch double-door entrance. The gables are not as steeply pitched as classic examples of Gothic Revival residential architecture, and the house form mimics that of the Folk Victorian gable-front-and-wing. It is nominated for its local significance in the area of architecture. The Hazlett-Hurd House, built in 1887 and redesigned in the 1920s, is located along a primary residential thoroughfare west of downtown Abilene. 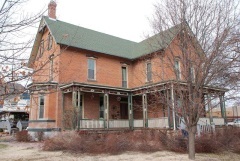 The house is named for two locally prominent men who lived in the home at different periods – Dr. Edward Hazlett and Arthur Hurd. Hazlett, who operated a busy medical practice and opened Abilene’s first hospital, built the house in 1887. His son Swede was a high school classmate and lifelong friend of Dwight Eisenhower’s, who later credited Swede with convincing him to apply for an appointment to the Naval Academy, and when that did not materialize, to West Point. 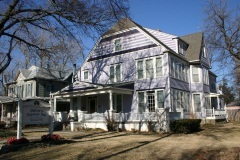 Local attorney and Abilene mayor Arthur Hurd purchased the house in 1916, and by the mid-1920s had significantly expanded the house to provide more parlor and bedroom space. After the renovation, the front porch featured simple porch columns and an adjacent pergola reflecting the more subdued Colonial Revival style. Importantly, though, it retained many Queen Anne stylistic features, too, including decorative wood shingles within the gables, the irregular footprint and roofline, interior woodwork, and general room arrangement. As a result, the house reflects two periods of development – the late 1880s and the mid-1920s – and the tastes of both the Hazletts and the Hurds. Today, the residence functions as a bed-and-breakfast. It was nominated for its social history and architecture.